Hydromulch (or hydraulic mulch seeding, hydro-mulching, hydroseeding) is a planting process that uses an application consisting of seeds, mulch, and fertilizer called a slurry. It is often used as an erosion control technique on construction sites, as an alternative to the traditional process of broadcasting or sowing dry seed. The hydro mulching process starts by mixing water, fertilizer, seeds, and mulch in a tank to create a slurry that can be sprayed on soil surfaces using a specialized hydraulic applicator. The slurry can be customized to address specific soil or seed requirements. Seed options include turf, wildflower, ground cover, and even shrub seeds. The hydromulch slurry, once applied, provides a protective cover that helps protect fledgling seeds from the elements while providing important nutrients ideal for seed germination. Most importantly it helps retain moisture critical for seed growth. Hydromulch slurry also helps seeds to germinate more quickly and evenly than other seeding methods. Of note, when the slurry is applied it appears as damp green clumps of tissue fibers. Do not be concerned, this green dyed protective coating disintegrates as seedlings sprout (2-5 days). The slurry is also an excellent erosion control option. 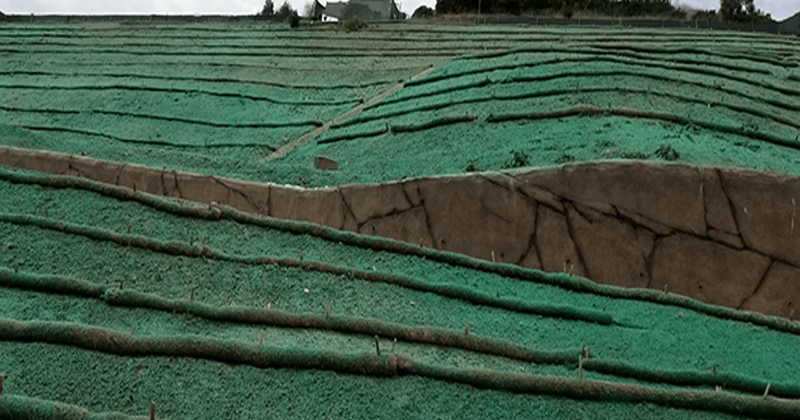 Applied properly, hydromulch allows seeds to rapidly root, adding stability to soil that is eroding, unstable, or on slopes with the potential of erosion from drainage, wind, or other elemental factors. Hydromulch is extremely cost-effective costing just pennies on the dollar compared to other planting methods, especially large areas and when applied to slopes. Traditional seeding methods require purchasing seeds, fertilizer, and mulch then applying each separately. Hydromulch dramatically reduces application time and labor requirements while delivering more even and uniform casting. We are Canyon Hydroseeding, we have been in business in Southern California for over 40 years. We offer Hydromulch, Hydroseeding Custom Seed Selection, Dust Dust Control Erosion Erosion Control, and Soil Stabilization. Call us to discuss your hydro mulching needs today at 951.680.1949.